The Grande House - Ocean Beach, San Diego near Sunset Cliffs, can also rent studio. This lovely large home with it's spacious backyard, , BBQ and deck MAY seem like the perfect venue for your wedding, bachelorette party, birthday party, reunion, old college friends get-together or whatever but IT'S NOT. This is a quiet, peaceful residential neighborhood and we need to keep it that way to not lose our right to do vacation rentals. If you are looking for a quiet family beach area vacation and can keep from subjecting the neighbors to Mission Beach type vacation rental noise, keep reading.... Maureen's private home in Sunset Cliffs that will sleep up to 9 very comfortably in beds. You can bring your furry family member also, as long as you don't leave your pet home alone to bark incessantly and disturb the neighbors. It has a large private yard for enjoying the outdoor California lifestyle. 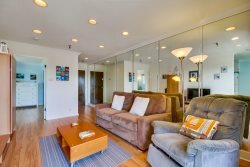 Located in a safe and quiet residential area, just a short walk to the ocean and Sunset Cliffs Natural Park for exploring the tide pools for which the area is famous. There is a little secret sandy beach just 6 blocks away at the end of Bermuda Ave but if you want a large, wide white-sand beach with lifeguards and restrooms and a long pier, Ocean Beach is just a little over a mile away. Garage and driveway will fit three cars. Laundry area in garage. There are 3 adult bikes, a razor, boogie boards, beach chairs, sand toys for the kids plus a Pack-n-Play and high chair.